"Based on fact, this is the story of William Marshal, the greatest knight of the Middle Ages, unsurpassed in the tourneys, adeptly manoeuvring through the colourful, dangerous world of Angevin politics to become one of the most powerful magnates of the realm and eventually regent of England. From minor beginnings and a narrow escape from death in childhood, William Marshal steadily rises through the ranks to become tutor in arms to the son of King Henry II and Eleanor of Aquitaine. A champion on the tourney field, William must face the danger and petty jealousy targeting a royal favourite. Dogged by scandal, banished from court, his services are nevertheless sought throughout Europe and when William's honour is vindicated, he returns to court and wins greater acclaim and power than before. A crusader and the only knight ever to unhorse the legendary Richard Coeur de Lion, William's courage and steadfastness are rewarded by the hand in marriage of Anglo-Irish heiress Isobel de Clare, 19 years old, the grand-daughter of kings and his equal in every way." I've been ruined by Sharon Kay Penman, utterly spoiled by her stories of Eleanor and her wild Angevin husband and children. I read her trilogy on Henry II and Eleanor of Aquitaine over a year ago, and nothing has yet to compare. Penman thoroughly went through the major events between the king and the queen that each retelling I've encountered barely holds a candle. Until now. 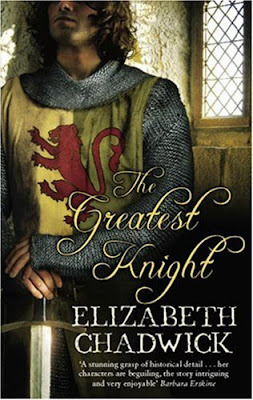 In Elizabeth Chadwick's story, The Greatest Knight, we learn more the story of William Marshal rather than just the royal family. Occurring between 1167 and 1194, William matures and becomes a knight, the subject matter and the main events are all focused around Henry and Eleanor's tumultuous marriage, their reign, their battles, and their boys who become kings themselves. The first 100 pages tells of how William Marshal was given over to King Stephen by his father, then William receives training, becomes a knight and is favored by Eleanor, which was intriguing and was holding its own for me. Soon he is tutoring Young Henry, aka the Young King, who is the eldest male to Eleanor and Henry and is set to inherit his father's title. We then shift the story to when Eleanor is imprisoned for inciting rebellion on behalf of her boys and Young Henry is quaking in his boots to become a king with all the benefits. I have heard this all before via Sharon Kay Penman, and it was all so vivid to me with her prose, and Chadwick's story was starting to fade for me. But, the caveat is that those who have not already read Penman's Henry and Eleanor trilogy will enjoy the beginning of the story just fine, because it is akin to the Tudor drama that I also love. This is a period that is much more violent, with more battles, a lot of passion and fierce loyalties. The battle scene that focused on William's turning from boy to man, where his uncle was killed, was an excellent scene. But then I felt a little robbed when Chadwick skipped over the battles that Young Henry and his forces had when they fought against his father King Henry. I was taken aback by the jump in time from chapter to chapter which downplayed some of the major turmoils of the time, and therefore lessened the amount of drama that I was waiting for, but this was William Marshal's story, and not Henry and Eleanor's. Once we get past the initial deja vu of the Henry vs. Eleanor story about 130 pages in, the drama picks up and I was much more intrigued with William Marshal as he becomes more of an honorable man to the reader. He grows from a child to a knight before our eyes. He becomes a tutor to the boys who will be kings, then he is a hostage, Queen Eleanor ransoms him (much to the disgust of others), he finds a mistress, loses the mistress, and eventually weds an heiress that gives William enough lands to make him almost the richest man next to the royal family (again, much to the disgust of others). William is portrayed as swift in battle and in tournaments, and as a loyal servant to his lord and his queen, and as a loyal husband. The novel involves the relationships of the other knights, his squires, and the lords that were jealous of William Marshal's high standing within the ranks. There was nothing lacking in his character; which is what brings Elizabeth Chadwick's fans clamoring for more. And that more is within her next novel, The Scarlet Lion, which is just being released in the USA this spring. The Greatest Knight ends with King Richard slowly regaining his power back from his rebellious and power hungry brother John Lackland after Richard's return from captivity in Germany. The next novel continues the story of William Marshal and his family as he still is loyal to the royal family after Richard is dead and John is king. The Scarlet Lion occurs between 1197 and 1219. As part of the Historical Fiction Bloggers Round Table, there are several events focusing on Elizabeth Chadwick and her new release of The Scarlet Lion beginning next week. Please see the Calendar of Events for more details.